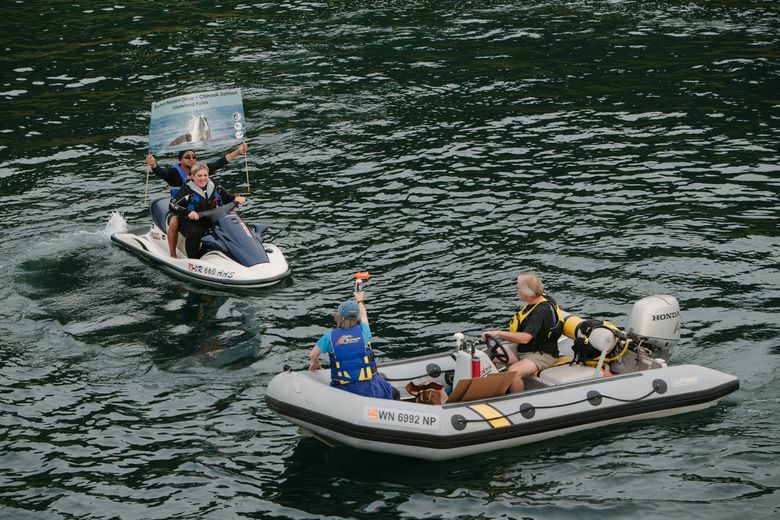 After last month’s catastrophe, people protest on the water and call for change. Clarification: This story has been edited to clarify reporting on the treatment of fish with antibiotics and the presence of pollution near fish farms. Last Saturday afternoon, I was aboard the F/V Galactic Ice, just off the south end of Bainbridge Island — only a few miles as the crow flies, plus a short, freezing swim, from Gov. Jay Inslee’s house. It was a balmy end-of-summer day with a hazy sun; every so often, the ferry from Seattle to Bremerton glided by, picturesque on the glinting water with a background of our noble fir trees. But this wasn’t a pleasure cruise. Something rotten is in the water, right there. It’s visible from the ferry, but its purpose is obscure: a strange, low-slung, metal-and-mesh setup that seems to float on the water, an industrial blot on a lovely Pacific Northwest landscape. Closer up, you get a sense of the scale of the thing, massive enough that its two porta-potties are dwarfed, as are the uniformed guards patrolling the catwalk perimeter. Inside watery pens, enclosed by netting, fish flip themselves up out of the water, one after another, over and over. It’s a sight that usually occasions joy: Look, a fish jumped! Here, it’s contained and constant, guarded and enmeshed. This is a net-pen fish farm. It looks like a jail, and it smells like death. It’s difficult to describe the stench that wafted in the breeze on the downwind side: fetid like fertilizer, acrid like ammonia, redolent of rot. The structure’s not far at all from Bainbridge’s shore; on a hot day, the smell at the pretty waterfront homes must be unbearable. 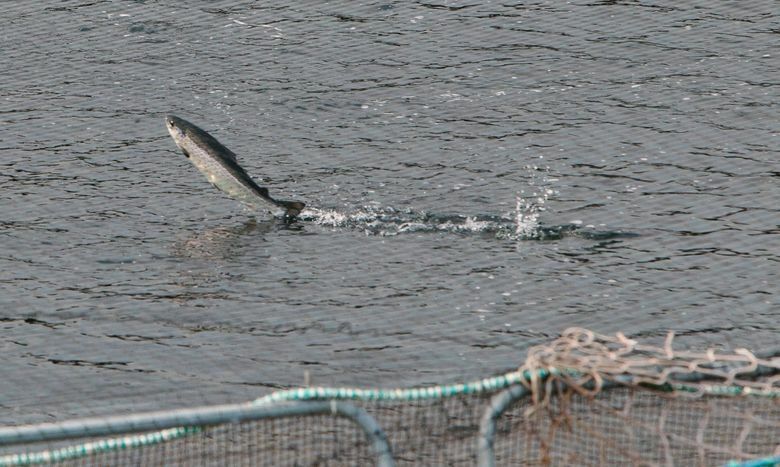 This fish farm is raising nonnative Atlantic salmon, just like the one that catastrophically collapsed near the San Juan Islands last month, and it’s owned by the same multinational, multibillion-dollar corporation, Cooke Aquaculture. Inslee called that situation “an emergency” and directed the Department of Ecology to put any new permits for salmon-farm net pens on hold. Now people of the Pacific Northwest are calling, urgently, for him to put a stop to net-pen fish farming in our waters altogether. 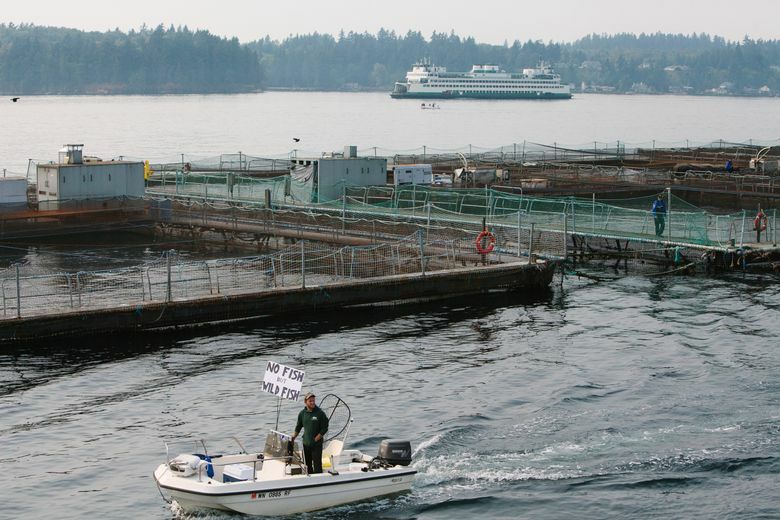 Douglas objects to net-pen farming, saying it brings sea lice, artificially lowers prices in the market, introduces invasive species into local waters and generates “intense clouds of waste.” The state Department of Ecology has established clean water standards for fish farms, but the sediment below this particular pen has not been sampled in the past 10 years. Off Bainbridge last Saturday, a fish-farm security boat got on a loudspeaker, booming across the water. “ON THE GALACTIC ICE, ON THE GALACTIC ICE,” the voice said. “FOR YOUR OWN SAFETY, YOU MUST STAY 100 FEET FROM THE PENS.” Untrue, as a Coast Guard vessel confirmed — those waters are our public waters. There was no legal injunction except against touching Cooke Aquaculture property. 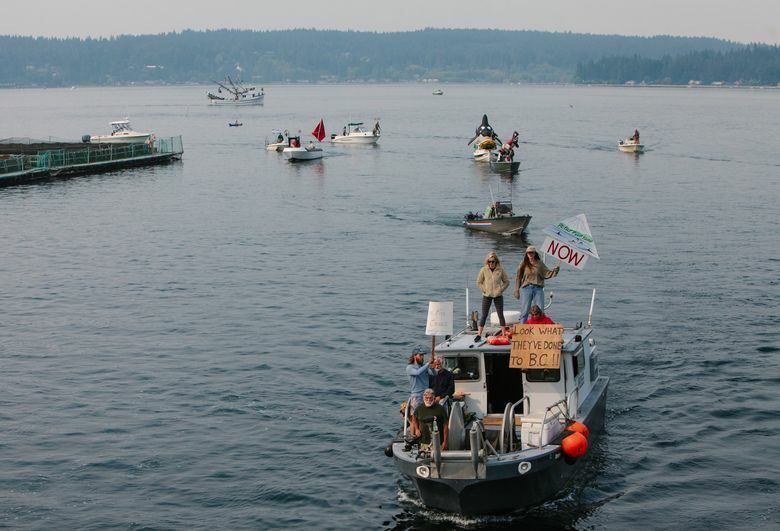 A ragtag protest flotilla was forming, planned by the nonprofit Our Sound, Our Salmon, with kayaks, canoes, stand-up paddleboards and one guy in a wet suit on a surfboard convening near shore. 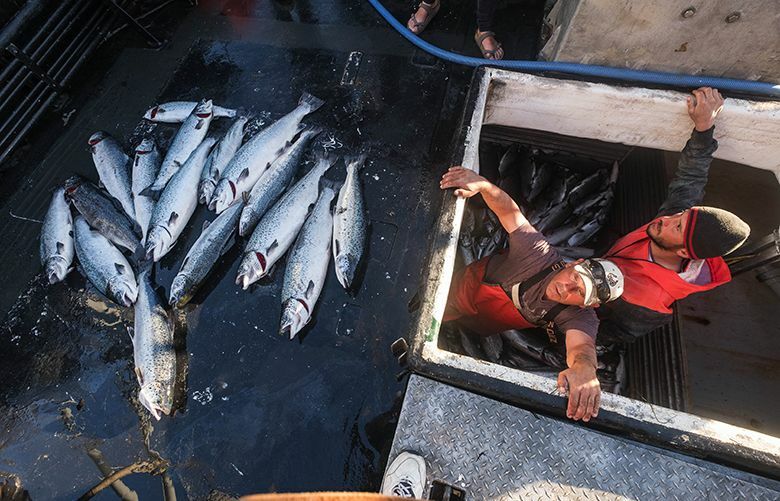 Eventually, a few dozen boats — recreational and commercial-fishing vessels, sailboats, a pretty little craft with a big Suquamish tribe flag — circled the fish farm’s pens. Homemade signs said the likes of “HEY JAY, WHATA YA SAY? BAN NET PENS,” “NUCK THE FET PENS” and “MAKE SALMON GREAT AGAIN.” Sometimes boater/protesters hollered “WHAT’S THAT SMELL? !” and held their noses, standing on their decks in the slow procession. Then two people on a Jet Ski noticed a bird trapped under the fish farm’s walkway, on the supporting structure just above the waterline, behind a wall of netting. It was a great blue heron, running back and forth frantically on its skinny legs, trying to get out. The guards, the woman on the Jet Ski shouted, had told her there was nothing they could do. Cooke Aquaculture wants to build yet another massive net-pen fish farm in the Strait of Juan de Fuca at Port Angeles. It’s unconscionable, from stem to stern. Think about it, Gov. Inslee.